The new single track trail at Echo Ridge is swoopy, fast and fun as it winds down through the landscape from Grand Junction to Alley Oop. The blackened burned out trees are a startling contrast to the beautiful green grasses and purple lupines. It is a trail to even be savored by new riders. Echo Ridge was originally developed as a Nordic Ski area on U.S. Forest Service land back in the 90s. The ski trails basically follow the contour of the hills and ridge tops with sweet ups and downs. 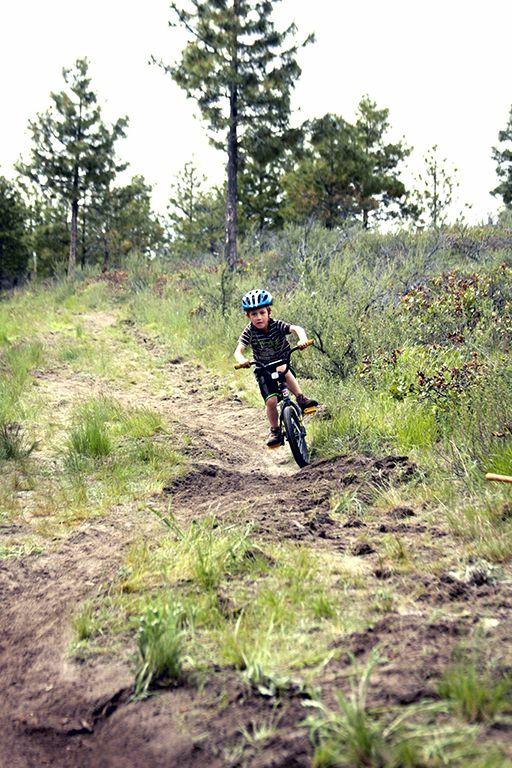 Echo Ridge quickly became the go-to area for local mountain bikers, but many more serious riders were not impressed with its easy trails. 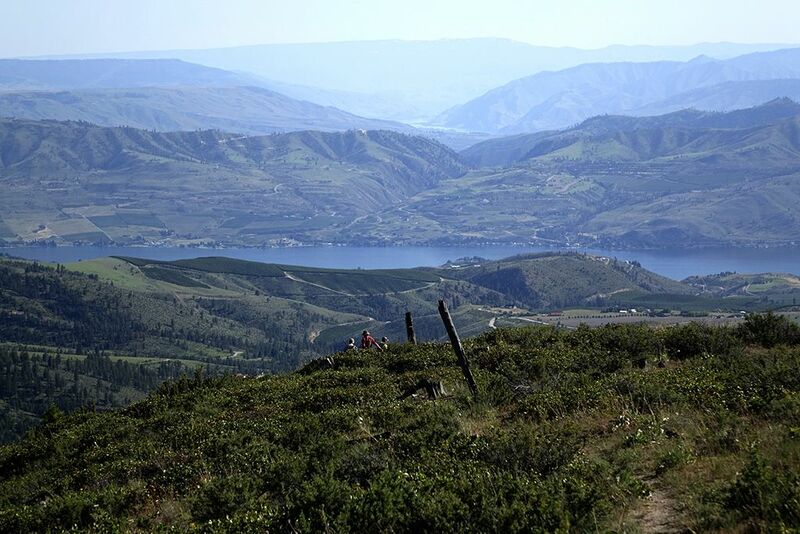 The view from Mallory’s Trail is spectacular with Lake Chelan, the Columbia River and Cascade Mountains in the background. 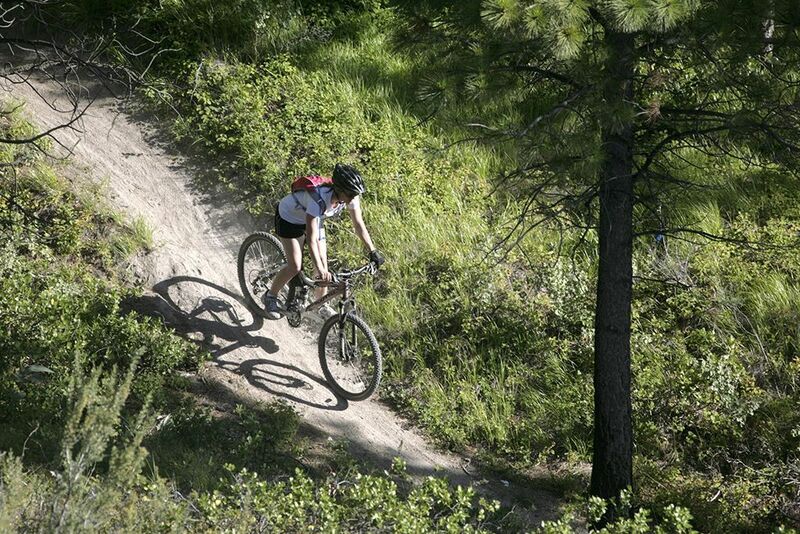 In 1995, the Lake Chelan Recreation Association was asked to host the 1995 Washington State Mountain Bike Championships by Round and Round, owners of the WIM Series. We accepted and got to work building a new trail on old logging skid roads. Today, that loop trail is called the Shoe. It added some excitement to the mountain biking contingent because it was fast, and potentially dangerous. Paul Willard gives the new Ridgeview Trail a trial run. Not much else happened at Echo Ridge trail wise, but it was becoming more and more popular with weekend warriors who just wanted to get out, get some exercise, and enjoy the outdoors, the scenery and the companionship of like-minded people. 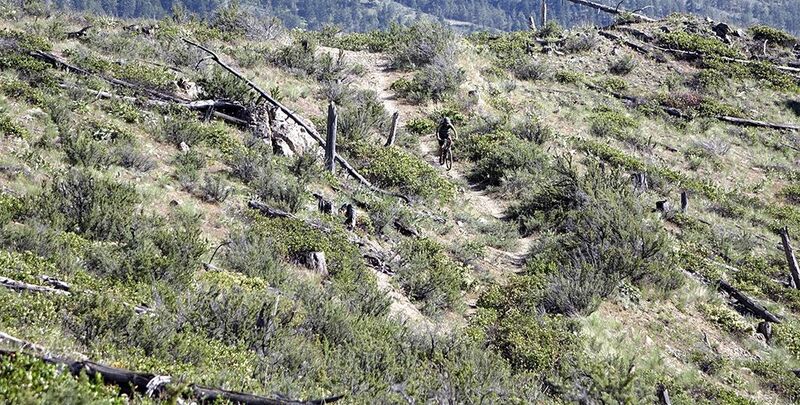 The DNA of Echo Ridge Mountain Biking changed when the Chelan Ranger District hired Paul Willard as its resource manager. Willard and the new Ranger, Kari Grover-Weir came on board from Idaho and both are avid mountain bikers. 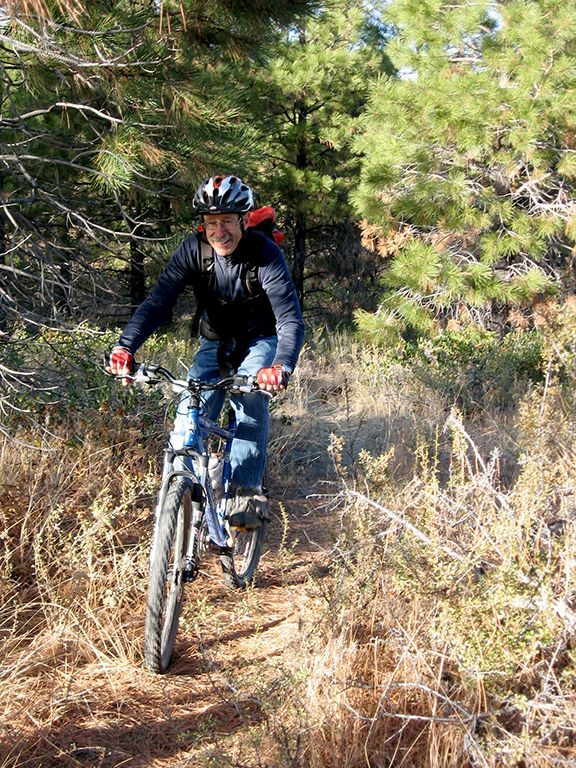 After looking at the Nordic Ski Area, Willard saw many opportunities to turn Echo Ridge into world-class multi-use trail system and began to work with local rider volunteers and the Central Washington Evergreen Mountain Bike Alliance members to make it happen. 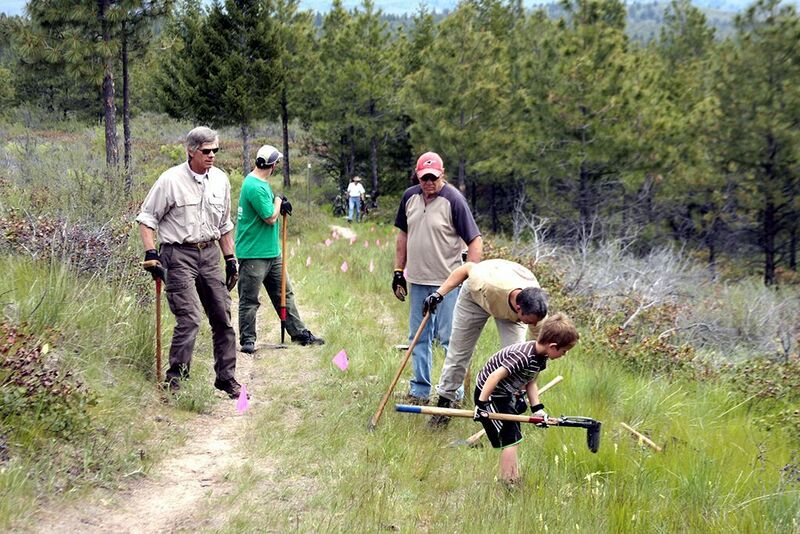 A volunteer trail crew from the Eastern Washington Mountain Bike Alliance cut a new single track line on the Ridgeview Trail. 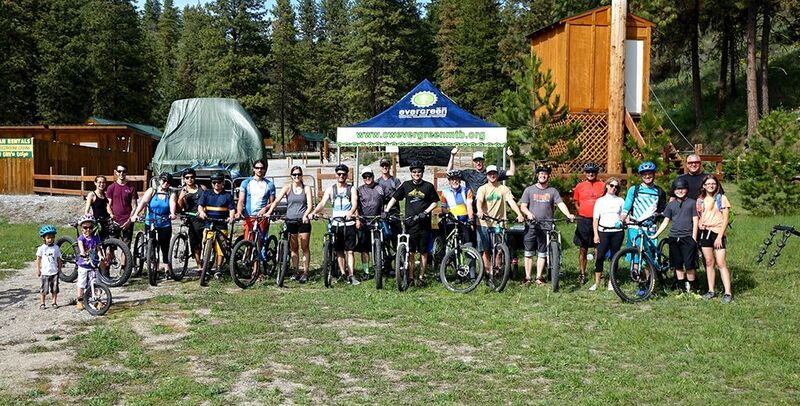 Members of the Eastern Washington Mountain Bike Alliance pose for a photograph at Echo Valley during an organized ride/BBQ event. The first trail work was on the existing View trail where volunteers under, Willard’s direction, put some swoopy, curves in the bottom section to slow riders down from the straight on run into Grand Junction. There was also a dream of connecting the Far East Trail to North Junction. An existing cow trail ran out of North Junction and the locals desired a single track connection to the Far East Trail. In the fall of 2011, the local group rode out on the Far East and explored the possible connection points. 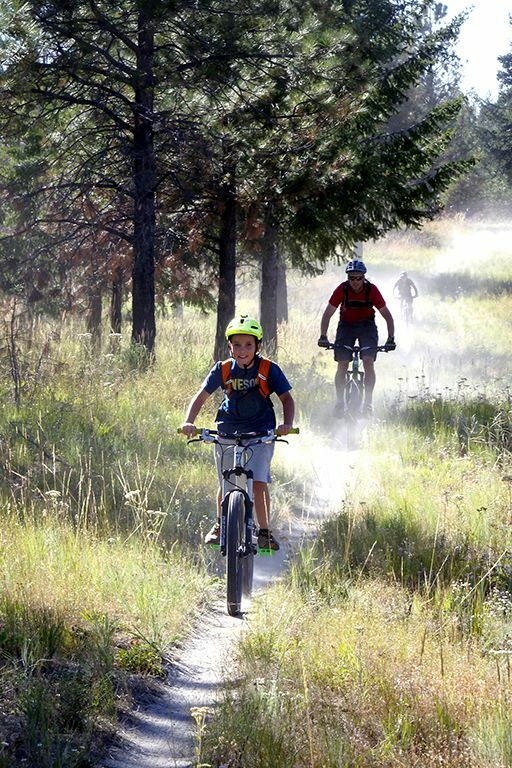 Of course, any new trail work has to go through a Forest Service permitting process including an environmental impact survey that has been vetted by the District staff, and it wasn’t until early summer 2014 that work began on a number of new, mountain bike specific trails. Eli Willard roars down Far East with dad, Paul, eating dust right behind. Dust to Glory, which has turned out to be one of the local mountain bikers favorite trails, got its start in early 2014 when a machine was brought in for the construction. Al Murphy, working with Willard and the Evergreen Mountain Bike Alliance cut the trail with a small mini excavator. Trail work was completed with volunteer labor to smooth out the rough edges. Today, Dust to Glory runs from the Far East junction all the way to North Junction and is an enjoyable ride in both directions. Dust to Glory was burned over during the 2015 Chelan Complex, but like Phoenix Rising, the area is regenerating with new grasses, trees, and in the spring a plethora of lupines filling the landscape with a purple blanket. The 2015 fire also burnt through to Ridge View changing the landscape into a blackened, stark place that needed reconstruction. 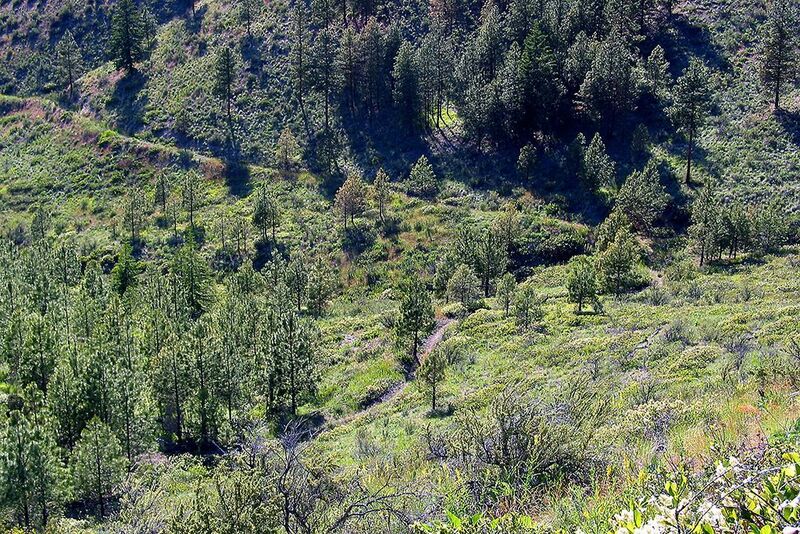 The Ridgeview Trail was used as a fire line and the rest of Echo Ridge was saved from the ravages of the fires. Waterbar Heaven used to run from the bottom of the Outback to a dozer road which ended up on the Cooper Mountain Road for a short run into Echo Valley. The water bars were fairly deep cuts that a rider had to be totally prepared for, particularly pedal position, otherwise, you would crash. In 2014 Willard and a group of volunteers went in and began work on the Waterbar Heaven and build a singletrack trail from the Outback down to Echo Valley. Bob Knauss was brought in to build a new single track from the intersection on the lower Outback trail to Waterbar Heaven. Waterbar Heaven was also used during the 2015 fires as a firebreak creating another opportunity to build new trail. This trail building exercise ends in Echo Valley and if a rider wants a long descent, he/she can climb to the top of Mallory’s Trail and descend 5.5 miles to Echo Valley. It is fast and fun for the intermediate rider. Kitty Green bombs down Minor Threat which was built by a group of middle school students from East Wenatchee under the watchful eye of Paul Willard. Talk about swoopy … Minor Threat, also built in 2014, is a short connector trail from the lower parking lot at Echo Ridge to the Shoe and was constructed by a group of middle school mountain bikers from East Wenatchee under Willard's direction. It is not for the squeamish as it dives and swoops down the steep grade. If you are competent, this trail can be fun. You just wish it would last longer. One of the newer trails that was completed in 2016 is called Divine Intervention. It is accessed from the lower parking lot just below Lolli Pop on an old Forest Service road. It is relatively flat and takes the rider south for some incredible views of the Lake Chelan Valley. 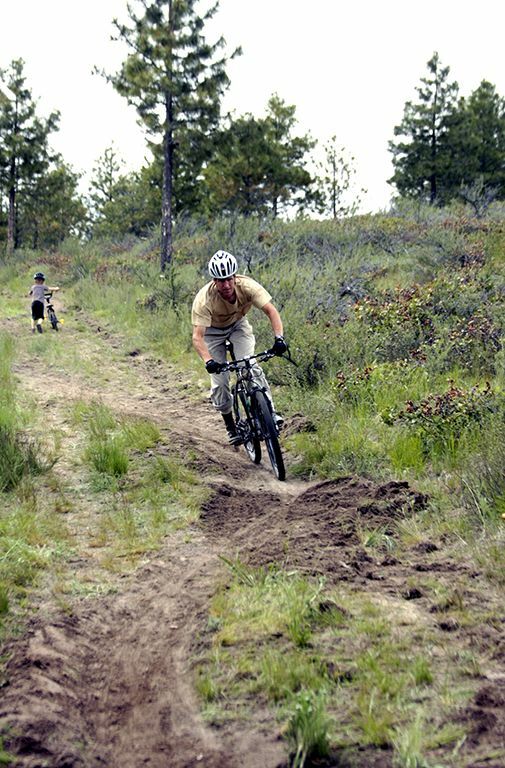 The fun starts at the end of the road where a single track has been constructed by Chelan Ranger District that takes the rider down a swooping, undulating trip to The Shoe, which was constructed way back in 1995 for the Washington State Mountain Bike Championships. 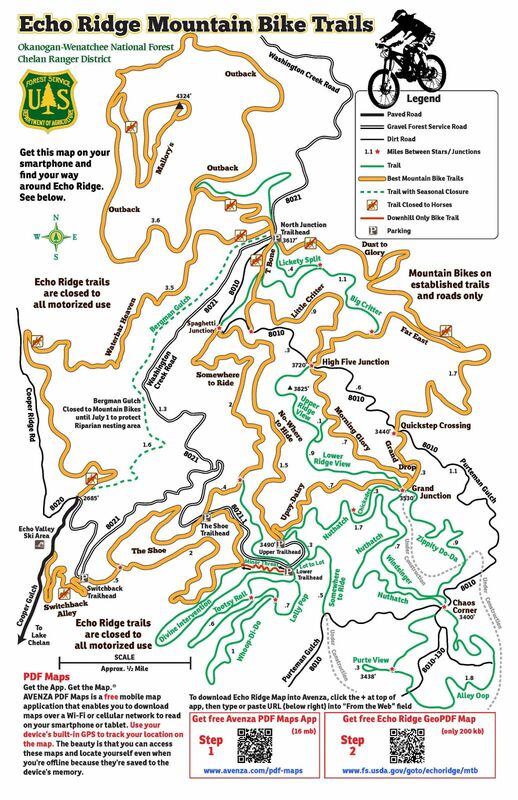 With 30 miles of trails beckoning the beginner to intermediate to the skilled rider, Echo Ridge offers a quality experience complete with spectacular views and fast flowy trails. Rick Schloss negotiates the narrow cow path, called T-Bone. From High Five Junction head down Far East to Dust to Glory, Waterbar Heaven to Echo Valley. 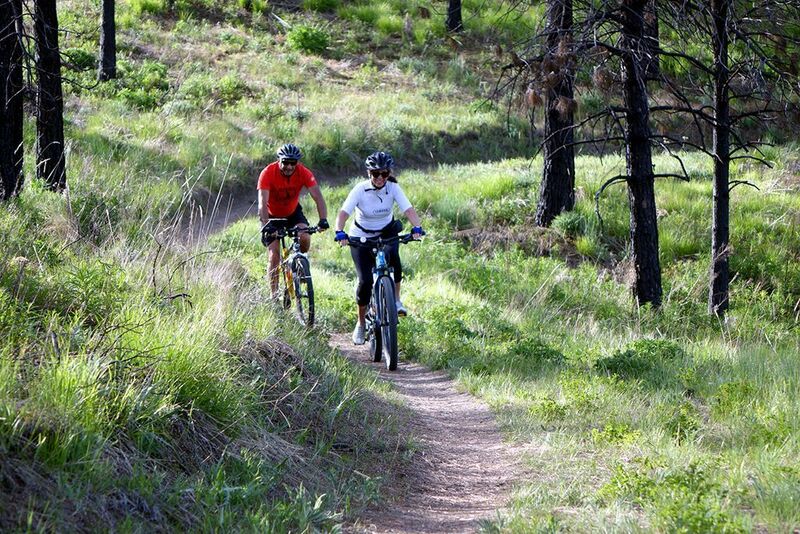 Pam Ahl and Rick Scholss ride Morning Glory, which is one of the favorite mountain bike trails on the Echo Ridge Ridge System. From High Five Junction, hit Ridgeview or Morning Glory to Grand Junction, up and down Upsy Daisy to the Upper and Lower Parking lots where you catch Minor Threat to the Shoe to Switchback Alley. If you don’t want to earn your downhill, you can shuttle to the Upper or Lower Parking Lots, to North Junction, Spaghetti Junction or High Five Junction to catch your favorite downhill run. 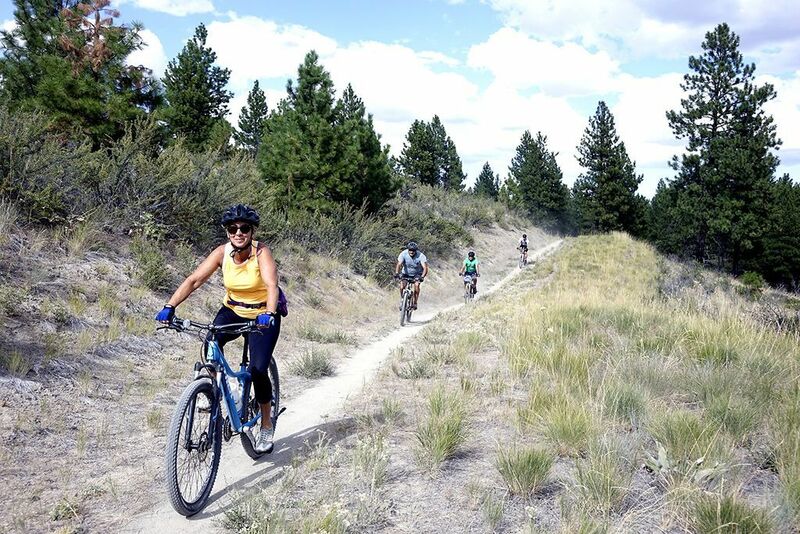 Pam Ahl, a local mountain biker leads a group down the new upper Waterbar Heaven Trail. Bob’s Trail is the newest addition to the Echo Ridge Trail System. 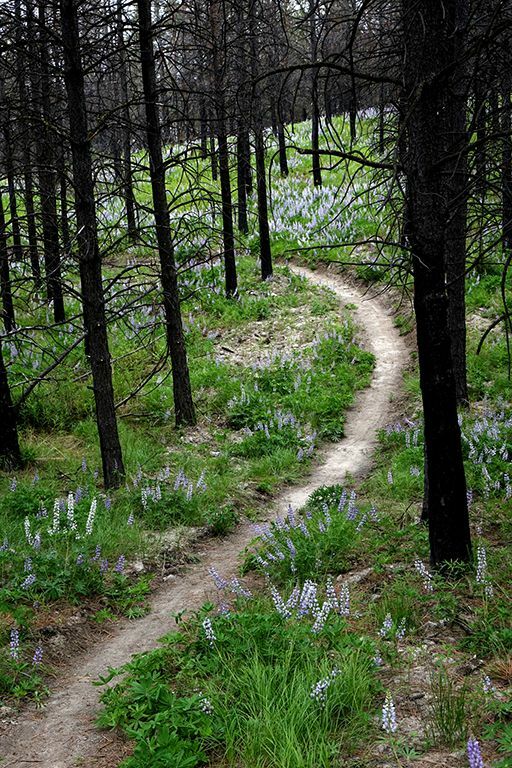 Designed by Paul Willard, U.S. Forest Service, the trail winds through forest from Grand Junction to Alley Oop at the lowest point on the system. This trail isn’t finished yet, but is a wonderful trail to ride both ways. 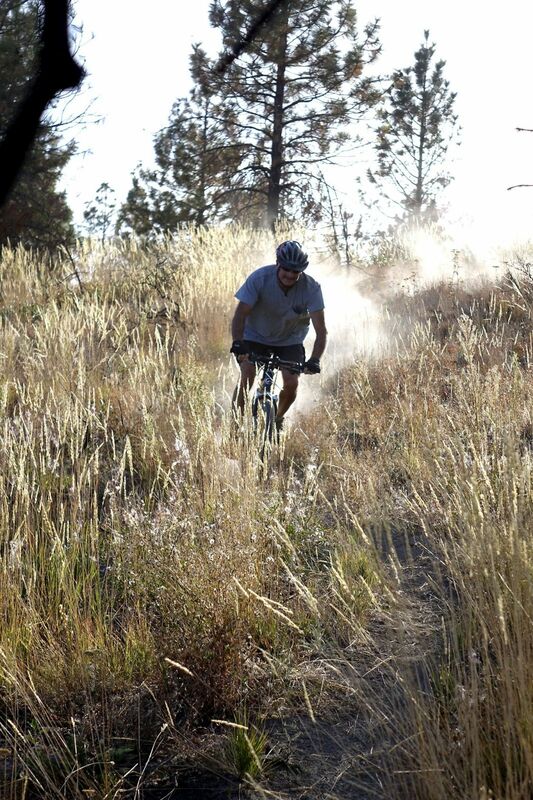 Bruce Willett winds his way down some single track at Echo Ridge. 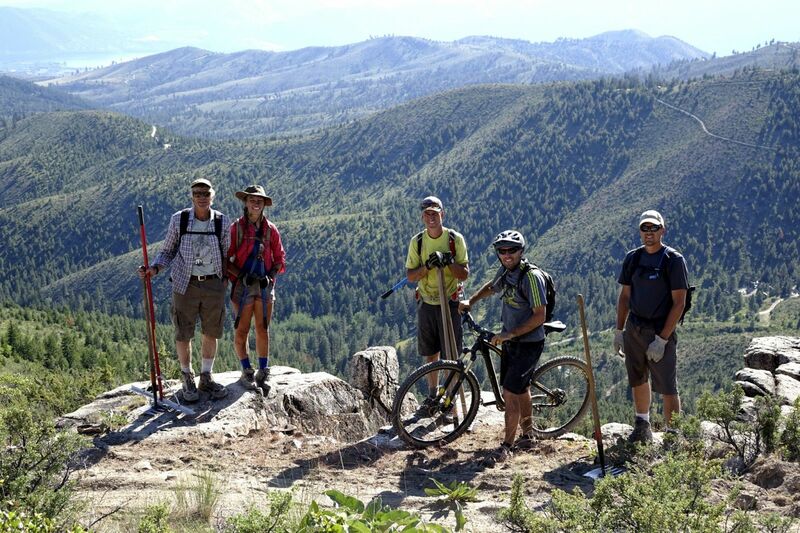 A volunteer trail crew poses for a photography on Mallory’s Trail. Mallory Lenz Machus was a Chelan Ranger District wildlife biologist who passed away after a long battle with cancer. From left to right are Wayne Machus, his daughter Delancy, Paul Willard, Coron Polley and Andy Wisdom. Pam Ahl and Rick Schloss ride Morning Glory which is one of the favorite mountain bike trails on the Echo Ridge System. Mallory’s Trail runs from the highest point at Echo Ridge on the Outback down to the Outback Trail. From the top to Echo Valley on Waterbar Heaven, a rider will get in 5.5 miles of downhill.